#1.1 12 Best Shooting Benches on the Market! #1.3.1 Why Use a Shooting Bench? #1.3.2 How Shooting Benches are different from a Regular One? #1.3.3 Would It Be Better to Get One with a Seat Included? #1.3.4 Are Some Manufacturers Better Than Others? #1.3.5 How to Build a Portable Shooting Bench? If you have been a hunter or a marksman for quite some time, you are quite familiar with the fact that it can get tiring sitting out there hour after hour waiting for your target or prey to appear. This is especially true if you are out hunting, and you are forced to wait long hours before your target finally arrives. Putting your weapon down or resting momentarily could deny you your opportunity for the kill, and this is why many opt to get themselves a shooting bench. It is the perfect solution, allowing you to constantly have your weapon at the ready, while also giving you an additional support to ensure that your aim is true and steady each and every time. While a shooting bench can be the perfect option for you, you want to purchase one that specifically fits your needs. Here are a few factors to consider when making your purchase. Seat. Consider that you will likely spend hours sitting on the seat provided for your table. Choosing one that is comfortable or enables you to be able to pad easily will make your time waiting a whole lot better. Hand Rest. Some shooting benches you will find offer you an additional foam pad to rest your hand or arm on. This is ideal for those who would be spending a long time looking down the side of their rifle waiting for the perfect opportunity to strike. It can get painful retiring without one of these features. Adjustability. That you are able to adjust the height of the table and the seat can be an important feature. You want to be able to be comfortable, especially if you are a taller or bigger person. Stability. Stability is a huge factor when choosing the right shooting bench. Not only do you have to worry about being comfortable while you were waiting, but some tables will shake during firing. You want something that is going to support your weight and remain firm when firing. Movement. Not only do you want the seat or table to be able to adjust, but you also want rotation. Many of the best products will allow you to quickly turn up to 360°. This may be a feature you truly want as you may need to rotate quickly to get the shot you desire. Portability. You will be carrying your bench in your backpack or in your arms to the location where you intend to fire. A heavy bench can be difficult for you to carry. Having one that is lightweight or that easily comes apart to make it easier to transport is more beneficial. Plus, you want one that is durably made so you can count on it lasting for years. Now that you know what to look for in a shooting bench, here are some quality products you may want to take a look at. Sometimes the simplest things are the very best things, and this called will shooting table is one such example. This is the perfect shooting table for those who need to spend long hours with their rifle watching and waiting for their next opportunity. This is built to provide you with stable design, and is built to add some additional comfort. It starts with the fact that you receive tripod as the base that provides an unbelievable level of stability. In situations where the ground may not be ideal, you’ll be pleased with how firm a foundation you can receive using this product. Next, you receive a padded seat and rest area, giving you an additional level of comfort. You are able to easily rotate around the base 360°, both the table and the seat. The table is made of a Polymer that protects against both water and chemical damage. The seat also enables you to be able to adjust from 16 inches to 22 inches, helping you to be more comfortable while sitting. Built-in holes are included on both sides of the table which enables you to be able to insert cleaning forks that can help to support your firearms. The entire frame is built of a solid metal, giving you durability you can count on and stability that will help you to get an accurate shot every time. Plus, you will love the fact that you can break this table into seven separate pieces, making it easier for you to carry. 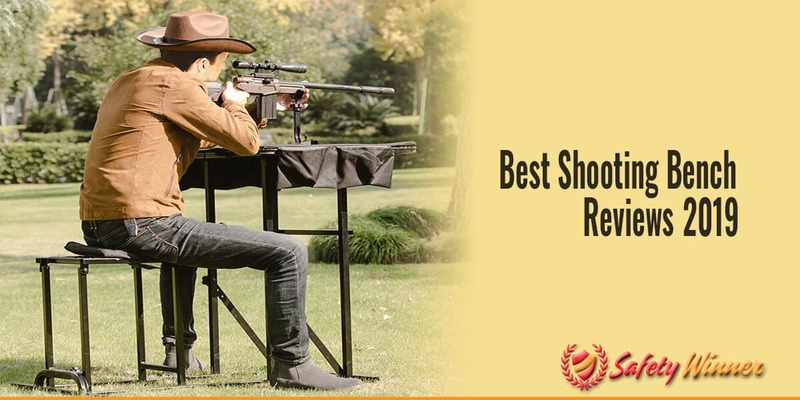 This Caldwell shooting table is an amazing product, and it is understandable why it tops our list. It does not matter your size or the type of firearm you are using, this can be the ideal shooting bench for almost any avid hunter or marksman. It starts with the fact that the seat is able to handle up to 300 pounds, making it ideal for almost any user. The table folds down to make it easy to transport, and ways just a little over 33 pounds. This makes it easy to slide into your trunk or the back of your truck while you head out to the range or to hunt, or it is easy to slide into a closet or cabinet to put away when you are not using it. An integrated gun rest is included in the table that allows you to be able to adjust it fully for the right height and position you need. There are three preset heights for adults and youths. Also included are two pockets on each side of the table that enable you to be able to store ammo, cartridges, or other accessories. The seat is padded with a comfortable foam, helping to make you more comfortable during those long hours sitting and waiting. The frame is made of a 1 inch steel tubing that is built to support a heavy weight and provide you with great longevity. You will be able to use this for years, because it is built to last. Once opened, it extends to 55.5 inches, is 34.5 inches wide, and reaches to 24 inches tall. Perfect size for anyone. The seat ranges from 12.5 inches all the way up to 17 inches. An offset is included that ranges from 6.75 inches to 8.75 inches. This is another folding shooting table, one that you will truly love as a user. It starts with the fact that it is built with an all steel frame, giving you great stability while you’re shooting, but also providing you with product you know that is built to last. It can handle up to 300 pounds of weight, and it is powder coated to prevent rust or corrosion. Makes it perfect for those who spend a lot of time out in the elements. You are able to adjust the height of both the table and the seat, a nice feature for those who intend to allow more than one person to use the table. In fact, there are specific settings that are preset for adults as well as youth, men or women. Plus, it is built to withstand just about any kind of landscape while still remaining stable. This shooting table is built to fold so that it is compact. This makes it easy for you to transport, as it weighs just 35 pounds, or to store in a closet or under a workbench. The shooting table platform is 24” x 24”, giving you plenty of space to set up your position. There are two pockets for ammunition and other accessories that are on each side of the table. 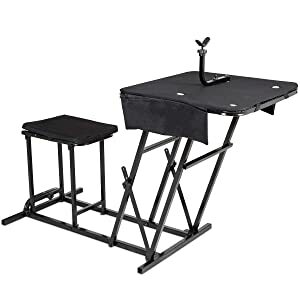 This is the perfect shooting table regardless of whether you are going out to the range, spending the day hunting, or are simply going to be sighting an area for a while. It comes at a price that is affordable for most people’s budget, and you will love that gives you a comfortable and efficient seat and table area. Fantastic table at a great price. #1 Why Use a Shooting Bench? The truth is that no matter how good of a shot you are and how stable you feel, you are likely to find that having a shooting bench provides you with the kind of stability and accuracy you can’t ignore. This allows you to stay focused on your target for hours, and be ready at a moment’s notice. For a person who intends to spend long hours sitting in a perch or gazing across a field for their prey to appear, you simply can’t beat this product. #2 How Shooting Benches are different from a Regular One? A regular bench is made for people to sit on. While many of the shooting benches come with seats attached, the purpose of this type of bench is to give you a place to perch your rifle or shotgun so that it is always in the ready position. It enables you to have an accurate shot each and every time, plus provide some additional support and comfort for your arm while you sit at the ready. #3 Would Iit Be Better to Get One with a Seat Included? That is a really good question. Many preferred the fact that there are options out there that already come with a seat. However, it is also true that for larger people or for those who need or desire a more comfortable seat, you may not want a shooting bench that already comes with an attached seat. Many report that some seats are difficult to sit in because of how large they are, so choosing a bench without a seat could be the better option. #4 Are Some Manufacturers Better Than Others? In this review, you saw that there are actually three Caldwell products. They do make outstanding shooting benches, and you can depend upon their products to give you a magnificent option, but don’t get stuck on manufacturer. There are seven or eight other manufacturers in this review, letting you know that there are a number of companies out there making outstanding products. #5 How to Build a Portable Shooting Bench? The truth of the matter is that it is incredibly important. Unless you have a spot on your own land where you could set up your table and just leave it, you are likely going to have to lug your shooting bench out to the range or out to hunt. Choosing one that is bulky, difficult to carry, and heavy, means you are not going to use it. It can simply become a waste of your money if it is not a portable option.